The End of Local? 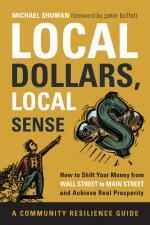 Book Review: Shuman's "Local Dollars, Local Sense"
Michael Shuman and interviewer Kate Poole, in Local Dollars, Local Sense, have combed the continent to uncover solid stories showing how local investment options have been created over the past 35 years. Their close interviews bring considerable practical wisdom. Ken Meter, president of Crossroads Resource Center, has taught economics at the University of Minnesota and the Harvard Kennedy School. He is one of the most experienced food system analysts in the U.S., having produced 83 regional and state food system assessments in 30 states, focused on geographic farm and food economies. A member of the Alliance for Building Capacity, he is also the author of Hoosier Farmer? Emerging Food Systems in Indiana.